The aim of this study was to assess the effectiveness of intraoperative lidocaine versus dexmedetomidine infusion on hemodynamic stability during pneumoperitoneum, as well as the recovery profile of diagnostic laparoscopic gynecologic surgeries. A total of 60 female patients of American Society of Anesthesiologist (ASA) physical status I were included in the study and divided into two groups: group L and group D. Group L received lidocaine hydrochloride 2%, and group D received dexmedetomidine hydrochloride. The hemodynamic changes during pneumoperitoneum as well as the recovery profile (postoperative sedation, pain scores, and analgesic requirements) were recorded. During pneumoperitoneum, group D patients showed a statistically significant decrease in mean heart rate compared with group L patients. However, the mean systolic blood pressure, diastolic blood pressure, and mean blood pressure in group L patients showed statistically and clinically nonsignificant changes compared with those of group D patients. As regards the recovery profile, group D patients recorded a significantly higher median sedation score compared with group L patients, and the postoperative pain scores were significantly better in group L than in group D patients after 30 min, 1 h from arrival at the postanesthesia care unit, and at 2 h in the ward. However, this resulted in a statistically nonsignificant number of patients requiring pethidine in the postanesthesia care unit, as well as statistically nonsignificant total pethidine requirements of less than 50 mg.
Lidocaine offers hemodynamic stability during pneumoperitoneum, as well as a decrease in the intensity of postoperative pain with opioid sparing, offering a less sedated patient than dexmedetomidine during day-case diagnostic laparoscopic gynecologic surgery. Fast-track laparoscopic gynecologic surgery has been developed to reduce postoperative morbidity, decrease the duration of hospitalization with early patient ambulation, and decrease tissue damage, thus accelerating postoperative recovery with reduced analgesic needs . Optimal postoperative pain relief is needed not only for patients’ comfort and satisfaction but also to facilitate their early mobilization with enhanced quality of life; with less postoperative cognitive impairment and reduced risk for persistent postoperative pain. This results in better overall outcome and reduced clinical expenses. However, intraoperative use of opioids may be associated with postoperative hyperalgesia and increased analgesic consumption. Thus, when it comes to ambulatory surgery, opioid-related side effects such as prolonged sedation, postoperative nausea and vomiting, ileus, and urinary retention may delay recovery and discharge . Also, creation of pneumoperitoneum is associated with significant hemodynamic changes in the form of abrupt elevations of mean blood pressure (MBP) and heart rate (HR), thus increasing the morbidity of the patient . Dexmedetomidine (Dex), the pharmacologically active d-isomer of medetomidine, is a highly selective and specific α2-adrenoceptor agonist; this might permit its application in relatively high doses for sedation and analgesia. In addition, it is a short-acting drug with a reversal drug for its sedative effect, atipamezole. These properties render it suitable during the whole perioperative period . Lidocaine, a systemic local amide, has analgesic, anti-inflammatory, and antihyperalgesic properties . In an effort to minimize postoperative opioid consumption, multimodal coanalgesics have been studied. Ease of availability, cost-effectiveness, simplicity of administration, and safety make lidocaine infusion an attractive option ,. Intraoperative lidocaine, as against dexmedetomidine infusion, as an alternative approach for opioid substitution, with its hemodynamic-stabilizing effect during pneumoperitoneum, is considered for day-case diagnostic laparoscopic gynecologic surgery for infertility, as studies have demonstrated its use in pain relief, although it can prove virtuous in attenuating the hemodynamic response to pneumoperitoneum. After taking approval from the Ethical Committee of Ain-Shams University and obtaining informed consent from each patient, this randomized controlled study was conducted at Ain-Shams University Hospitals on 60 female patients scheduled to undergo diagnostic laparoscopic gynecologic surgery for infertility by the same surgical team. Preoperative evaluation included a detailed history, physical examination, and investigations, which included hemoglobin level, liver and kidney function tests, and ECG. Also, during the preanesthetic visit, all patients were familiarized with the study, including the use of the visual analogue scale (VAS) for pain assessment (from 0, no pain, to 10, worst imaginable pain). Female patients aged between 23 and 40 years of ASA physical status I were eligible for participation in the study. Patients with a known history of hepatic disease, renal dysfunction, any cardiac dysrhythmias, atrioventricular block, hypertension, hypersensitivity to the study medication, or chronic pain, or concomitantly taking clonidine, methyldopa, β-blocking drugs, benzodiazepines, or monoamine oxidase inhibitors were excluded from the study. In addition, patients whose anticipated duration of surgery was more than 3 h were excluded. Group L (30 patients): Immediately before induction of anesthesia, patients received a loading dose of intravenous 1.5 mg/kg lidocaine hydrochloride 2% (Sigma-Tec pharmaceutical Indust Co For Al-Debeiky Pharmaceutical Industries Co packed by Al-Debeiky pharmaceutical Industries Co.-A.R.E., Zone 11 Block 12014 Obour City Ind Zone) slowly over 10 min, followed by intravenous infusion of 2 mg/kg/h lidocaine hydrochloride 2% through an infusion pump (B-Braun). The infusion was continued throughout the surgery and terminated after release of pneumoperitoneum. Group D (30 patients): Immediately before induction of anesthesia, the patients in this group received a loading dose of intravenous 0.5 μg/kg dexmedetomidine hydrochloride (Precedex 200 μg/2 ml) slowly over 10 min, followed by intravenous infusion of 0.4 μg/kg/h dexmedetomidine through an infusion pump (B-Braun, Bethlehem, U.S.). The infusion was continued throughout the surgery and terminated after release of pneumoperitoneum. The loading and infusion doses of 2% lidocaine hydrochloride and dexmedetomidine hydrochloride were calculated according to the patient’s body weight and diluted to a 10 ml volume (labeled as loading-1 and loading-2) and a 50 ml volume (labeled as infusion-1 and infusion-2). The anesthetic and surgical techniques were standardized for all patients in the study. In the induction room, the 60 patients had an intravenous cannula inserted in the dorsum of the nondominant hand. All patients were then premedicated with intravenous 1 mg granisetron (Granitryl 1 mg/ml; Alex Co., for Egy-pharma, Egypt), 0.05 mg/kg midazolam hydrochloride (Dormicum, 5 mg/ml; Roche, Basel, Switzerland), and 1 μg/kg fentanyl (Sunny Pharmaceutical, Industrial Zone, Badr City, Egypt under license of Hamelin Pharmaceuticals, Germany). On arrival at the operating room five-lead ECG, noninvasive blood pressure monitoring, and pulse oximetry were started using General electric-Dash 5000 (GE Medical Systems Information Technologies Inc., Milwaukee, Wisconsin, USA). Capnography was initiated after induction of anesthesia. The patients were preloaded with 5 ml/kg of Ringer acetate solution. Anesthesia was induced with intravenous 2 mg/kg propofol (Propofol 1%; Fresenius Kabi Deutschland GmbH Grazia) and 0.15 mg/kg cisatracurium besylate [Nimbex, 10 mg cisatracurium (bis-cation) in 5 ml. GlaxoSmithKline manufacturing S.p.A, Parma, Italy]. A second intravenous line was secured for administering dexmedetomidine or lidocaine infusion. After 3 min of controlled mechanical ventilation using oxygen (8 l of 100% O2) and 1.2% isoflurane (forane, isoflurane, USP, liquid for inhalation, 250 ml; Baxter Healthcare Corporation, Deerfield, IIIinois, USA), the patients were intubated using a Macintosh laryngoscope blade, and a cuffed 7.5 mm I.D. endotracheal tube was inserted orally. Maintenance of anesthesia was done with oxygen (3 l of 60% O2) and 1.2% isoflurane; further neuromuscular blockade was maintained with intermittent boluses of 0.03 mg/kg cisatracurium besylate intravenously as needed. Maintenance dose of Ringer lactate solution was infused. Patients were mechanically ventilated using a Datex-Ohmeda Inc. (3030 Ohmeda Drive Madison WI, USA) anesthesia machine attached to a closed circuit system fitted with a circle absorber. Intermittent positive pressure ventilation was adjusted to maintain an end-tidal carbon dioxide (EtCO2) value between 30 and 35 mmHg such that the airway pressures were kept to a minimum with tidal volume at 6 ml/kg and a respiratory rate of 15 breaths/min with a positive end-expiratory pressure of 5 mmHg. Pneumoperitoneum was achieved with carbon dioxide (insufflation into the peritoneal cavity at a rate of 2 l/min), and intra-abdominal pressure was maintained to 14 mmHg throughout the laparoscopic procedure. Three additional 5-mm ports were introduced. Patients were positioned with their heads lowered 15° just before the procedure started. As the pneumoperitoneum was released, drug infusion was stopped. After completion of surgery, the residual neuromuscular blockade was antagonized with the mixture of intravenous injection of neostigmine 0.05 mg/kg and atropine 0.02 mg/kg. The trachea was extubated once the patient regained consciousness and the patients were transferred to the postanesthesia care unit (PACU). A patient with a VAS score of more than 4 was treated with 1 g paracetamol (Perfalgan vial, 100 ml of 10 mg/ml; Bristol-Myers Squibb Australia Pty Ltd). If the patient’s VAS remained greater than 4 after 30 min, intravenous boluses of 25 mg pethidine (pethidine hydrochloride, 50 mg/ml; Misr Co., For pharmaceuticals, Alexandria, Egypt) were given. After 1 h of observation in the PACU, the patient was transferred to the ward. The hemodynamic changes [mean values of systolic blood pressure (SBP), diastolic blood pressure (DBP), MBP, and HR] during pneumoperitoneum (at 10, 20, and 30 min) constituted the primary outcome. Demographic data of the patients: age, weight, height, and BMI. Hemodynamic parameters (mean values of SBP, DBP, MBP, and HR) at baseline, before induction of anesthesia, 5min after endotracheal intubation, before pneumoperitoneum, after release of pneumoperitoneum, and 10min after extubation in the PACU. Postoperative sedation score ([Table 1]). Postoperative pain score: Intensity of pain was monitored at 15 and 30min after arrival at the PACU, then 1h before discharge from the PACU, then at 2, 4, 8, and 12h in the ward using the VAS score. For analysis, pain severity was categorized as absent (VAS=0), mild (VAS=1–3), moderate (VAS=4–7), severe (VAS=7–9), and very severe (VAS=10). Pethidine requirements: Number of patients requiring pethidine in the PACU and the total dose of pethidine over 12 postoperative hours. SpO2 recorded in the PACU. Group sample sizes of 28 and 28 achieved 81% power to detect a difference of 10.0 between the null hypothesis that both group means are 85.0 and the alternative hypothesis that the mean of group 2 is 75.0 with estimated group SDs of 13.0 and 13.0 and with a significance level (α) of 0.05000 using a two-sided two-sample t-test. Therefore, 30 patients per group were included to replace any dropouts. The statistical analysis was performed using a standard SPSS software package, version 17 (SPSS Inc., Chicago, Illinois, USA). Data were expressed as mean values±SD, median (interquartile range), or n (%). The Student t-test was used to analyze the parametric data, the Mann–Whitney test was used to analyze nonparametric data, and the χ2-test was used to analyze categorical variables, with P-values less than 0.05 considered statistically significant. Sixty female patients undergoing diagnostic laparoscopic gynecologic surgery for infertility were enrolled in the study (30 patients in each group). The results of the comparison of the general characteristics of the study population in the two groups are given in [Table 2]. No statistically significant difference was observed in their demographic data − age, weight, height, and BMI (P=0.25, 0.2, 0.174, and 0.216, respectively). The duration of surgery and the duration of anesthesia were comparable between the two groups (P=0.46 and 0.09, respectively) ([Table 3]). 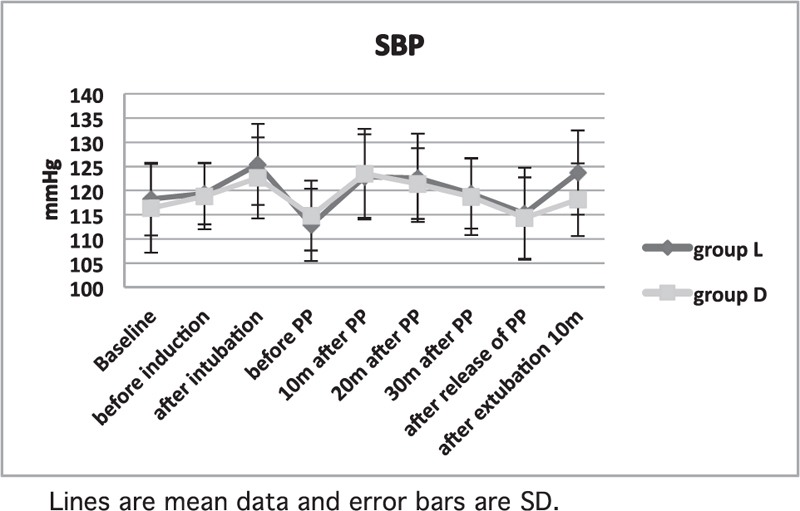 According to the hemodynamic parameters there was no statistically significant difference between the two groups as regards the mean values of SBP recorded ([Figure 1]): baseline values (P=0.34), before induction of anesthesia (P=0.078), 5 min after endotracheal intubation (P=0.097), before pneumoperitoneum (P=0.33), during pneumoperitoneum at 10, 20, and 30 min (P=0.661, 0.322, and 0.445, respectively), and after release of pneumoperitoneum (P=0.098). However, the value recorded 10 min after extubation in the PACU was significantly lower in group D than in group L, with a P-value of 0.002. Figure 1: Changes in mean values of systolic blood pressure (SBP). Lines are mean values and error bars are SD. 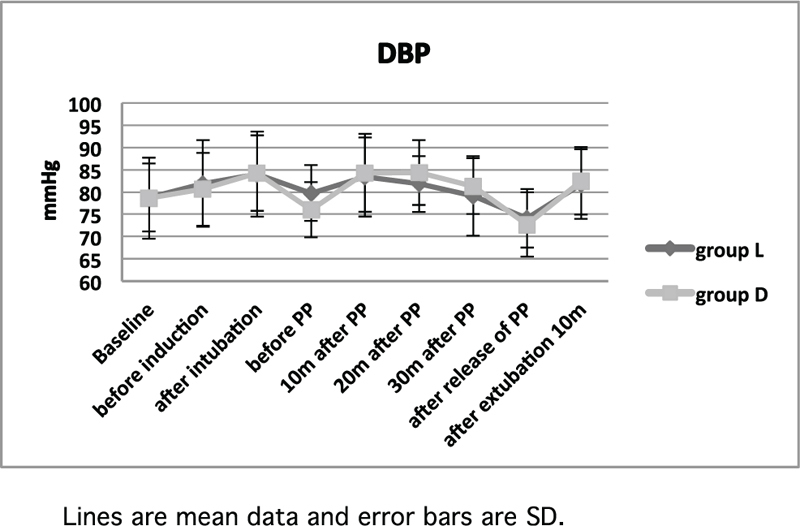 As regards the mean values of the DBP, there was no statistically significant difference between the two groups as regards the mean values of the DBP recorded ([Figure 2]): baseline values (P=0.88), before induction of anesthesia (P=0.423), 5 min after endotracheal intubation (P=0.87), before pneumoperitoneum (P=0.68), during pneumoperitoneum at 10, 20, and 30 min (P=0.56, 0.57, and 0.951, respectively), after release of pneumoperitoneum (P=0.36), and 10 min after extubation in the PACU (P=0.565). Figure 2: Changes in mean values of diastolic blood pressure (DBP). Lines are mean values and error bars are SD. 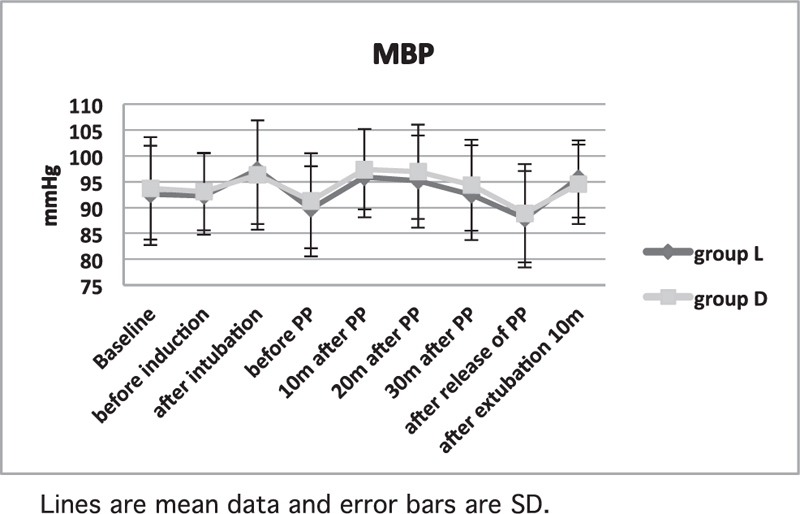 As regards the mean values of the MBP, there was no statistically significant difference between the two groups as regards the mean values of the MBP recorded ([Figure 3]): baseline values (P=0.93), before induction of anesthesia (P=0.99), 5 min after endotracheal intubation (P=0.79), before pneumoperitoneum (P=0.78), during pneumoperitoneum at 10, 20, and 30 min (P=0.6, 0.385, and 0.64, respectively), after release of pneumoperitoneum (P=0.86), and 10 min after extubation in the PACU (P=0.2). Figure 3: Changes in mean values of mean blood pressure (MBP). Lines are mean values and error bars are SD. 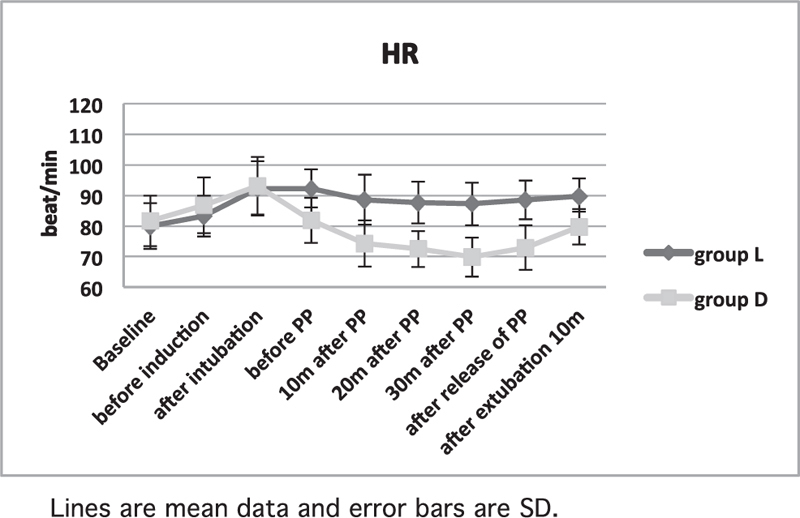 As regards the mean values of the HR, there was no statistically difference between the two groups as regards the mean values of the HR recorded ([Figure 4]): baseline values (P=0.445), before induction of anesthesia (P=0.56), and 5 min after endotracheal intubation (P=0.993). However, the mean values of the HR showed significantly lower values in group D than in group L: before pneumoperitoneum (P<0.001), during pneumoperitoneum at 10, 20, and 30 min (P<0.001), after release of pneumoperitoneum (P<0.001), and 10 min after extubation in the PACU (P<0.001). Figure 4: Changes in mean values of heart rate (HR). Lines are mean values and error bars are SD. Regarding the postoperative sedation score ([Table 4]), patients in group D recorded significantly higher median values throughout the study period: after 15 min, 30 min, and 1 h from arrival at the PACU (P=0.003, 0.04, <0.001, respectively) and then in the ward at 2, 4, 8, and 12 h (P=0.004, 0.04, 0.018, and 0.018, respectively). 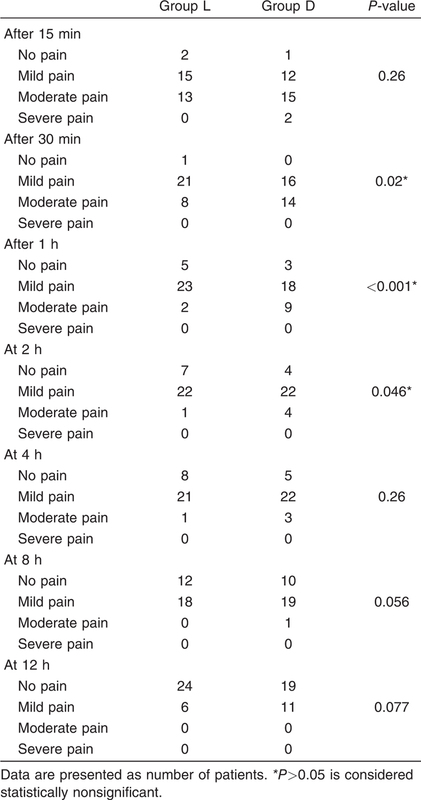 As regards the postoperative pain ([Table 5]), 15 min after arrival at the PACU, patients of both groups showed a statistically nonsignificant difference (P=0.26), with higher pain scores in patients of group D, as most patients had mild (12 patients) to moderate (15 patients) pain, with two patients having severe pain and only one patient with no pain. In group L, most patients showed mild (15 patients) to moderate pain (13 patients), with no patient with severe pain and two patients with no pain. Thirty minutes after arrival at the PACU, the pain score was statistically significant between the two groups (P=0.02); the intensity of pain started to decrease in both groups with patients mainly showing mild to moderate pain and only one patient in group L with no pain. One hour after arrival at the PACU, the intensity of pain showed a statistically significant decrease in pain scores in both groups (P<0.001), where the number of patients with no pain increased in both groups (five in group L and three in group D), and the number of patients with moderate pain decreased in both groups (two in group L and nine in group D), and most patients showed mild pain (23 in group L and 18 in group D). After 2 h in the ward, the intensity of pain showed a statistically significant decrease in pain scores in both groups (P=0.046), where the number of patients with no pain increased in both groups (seven in group L and four in group D) and the number of patients with moderate pain decreased in both groups (one in group L and four in group D) and 22 patients in both groups had mild pain. After 4 h in the ward, the intensity of pain showed statistically nonsignificant pain scores between the two groups (P=0.26), where the number of patients with no pain increased in both groups (eight in group L and five in group D) and the number of patients with moderate pain decreased in group D (three patients), with most patients having mild pain (21 in group L and 22 in group D). After 8 h in the ward, the intensity of pain showed a statistically nonsignificant difference in pain scores between the two groups (P=0.056), where the number of patients with no pain increased in both groups (12 in group L and 10 in group D), the number of patients with moderate pain decreased in both groups (0 in group D and one in group L), and the number of patients with mild pain also decreased (18 in group L and 19 in group D). After 12 h in the ward, the intensity of pain showed a statistically nonsignificant difference in pain scores between the two groups (P=0.077), where the number of patients with no pain increased in both groups (24 in group L and 19 in group D), there were no patients with moderate pain, and the number of patients with mild pain also decreased (six in group L and 11 in group D). In the PACU, 21 patients in group L and 24 patients in group D required pethidine and this difference between the two groups was statistically nonsignificant (P=0.54). Thus, the total dose of pethidine given to patients in both groups was less than 50 mg and this was statistically nonsignificant (P=0.538) ([Table 6]). In the PACU, no patient in either group developed postoperative respiratory depression, as the SpO2 range was 97–99% on room air. Laparoscopic gynecologic procedures are commonly adopted for gynecologic surgery because of their economic value. However, three types of pain are reported after laparoscopic surgery: parietal (somatic) pain, due to the holes made in the abdominal wall for the trocars; visceral pain, due to surgical handling and diaphragmatic irritation by the dissolved CO2; and shoulder tip pain, due to rapid distension of the peritoneum (associated with tearing of blood vessels, traumatic traction of the nerves, and the release of inflammatory mediators) and excitation of the phrenic nerve. Visceral pain is predominant during the first 24 h postoperatively. It is short-lived, unaffected by mobilization, and is increased by coughing. Shoulder pain can sometimes last for 3 days . Also, creation of pneumoperitoneum is associated with significant hemodynamic changes . These hemodynamic responses are due to the increased release of catecholamines, vasopressin, or both , possibly because of an increase in the intraperitoneal pressure and CO2 stimulation of the peritoneum. Various pharmacological agents like nitroglycerine , β-blockers, opioids, gabapentin, pregabalin, magnesium sulfate, clonidine, and dexmedetomidine are used to provide hemodynamic stability during pneumoperitoneum, with varying success rates . Dex provides significant sympatholytic (postsynaptic activation of α2 adrenoceptors in the central nervous system) and hemodynamic stability . After intravenous administration, it exhibits a rapid distribution phase with a distribution half-life (t½ α) of 6 min and elimination half-life (t½ β) of 2 h, and exhibits linear kinetics (a constant amount of the drug is eliminated per hour rather than a constant fraction of the drug) when infused in a range of 0.2–0.7 µg/kg/h for no more than 24 h . Dex modulates the hemodynamic changes during pneumoperitoneum by inhibiting the release of catecholamines and vasopressin . Lidocaine has a stabilizing effect on the heart and blood pressure, possibly by direct myocardial depressant effect, a peripheral vasodilating effect, and through its anti-inflammatory activity . In our study, both lidocaine and Dex infusions reduced the elevations in the mean values of the SBP, DBP, MBP, and HR during pneumoperitoneum. Although Dex attenuation of the HR was statistically highly significant compared with that of lidocaine, this was clinically nonsignificant as the maximum increase in the mean values of the HR in group L was less than 20% from the baseline value and was not associated with a significant increase in the mean values of the SBP, DBP, and MBP. This is in agreement with the results of Priyesh and Pinakin in 2015  on lidocaine; they reported a slight increase in these parameters with greater hemodynamic stability during pneumoperitoneum. We selected our Dex infusion rate guided by the studies of Ramsay and Kuterman (2004) , Tanskanen et al. (2006) , Bhattacharjee et al. (2010) , Manne et al. (2014) , and Vinit et al. (2015) , who stated that low-dose infusion of 0.25–0.5 μg/kg/h controls the rise in MBP and HR during pneumoperitoneum and maintains MBP and HR in an acceptable range for a long duration, with good hemodynamic stability. Dex attenuates the sympathoadrenal response to the perioperative stress periods, thereby decreasing serum epinephrine and norepinephrine levels because of its sympatholytic action ,,. Lidocaine attenuates the sympathoadrenal response by blunting the direct laryngoscopy and endotracheal intubation reflexes . In our study, neither Dex nor lidocaine attenuated the increase in the mean values of HR 5 min after endotracheal intubation, but this increase was not associated with a clinically or statistically significant increase in the mean values of SBP, DBP, and MBP. However, the attenuation of the mean values of HR by Dex was prominent before creation and after release of pneumoperitoneum, although this attenuation was not reflected statistically on the mean values of SBP, DBP, and MBP. Also, Dex attenuated the increase in the mean values of HR after extubation more than did lidocaine, and this attenuation reflected a statistically significant decrease in the mean values of SBP in group D compared with in group L. In 2004 Ramsay and Kuterman  and in 2010 Bhattacharjee et al. showed that Dex provided good hemodynamic stability during laryngoscopy, intubation, and during emergence from anesthesia. In 2000, Talke et al. , in 2003 Wijeysundera et al. , in 2012 Priya et al. , and in 2013 Chirag et al. found that Dex also attenuated the effects during emergence from anesthesia and extubation. This variability in results from our study are mostly due to decrease in the loading dose to 0.5 µg/kg/h; in 1992, Jaakola et al. reported that Dex significantly reduced the MBP and HR response to intubation at a dose of 0.6 µg/kg, whereas Hogue et al. in 2002 , Soliman et al. in 2011 , and Ozkose et al. in 2006  found that a loading dose of 1 µg/kg Dex attenuates the increase in HR and MBP. Also, variable results for the effects of lidocaine were available; in 2010, Baral et al. found the SBP, DBP, MAP, and HR to be significantly attenuated at the time of laryngoscopy and endotracheal intubation, whereas in 1990 Miller and Warren , in 1991 Wilson et al. , and in 2015 Prasad et al. found that intravenous lidocaine did not effectively attenuate the hemodynamic response to laryngoscopy and intubation. Dex is an anxiolytic, sedative, and analgesic agent with opioid-sparing effect . This is attributable to presynaptic activation of the α2-A adrenoceptors inhibiting the release of norepinephrine; the spinal level (the substantia gelatinosa) is the principal site with a supraspinal (locus coeruleus) and peripheral site (nerve endings) of action . Dex induces arousable sedation, qualitatively resembling normal sleep. The participation of nonrapid eye movement sleep pathways seems to explain why patients who appear to be deeply asleep are relatively easily aroused . Sedation induced by Dex is dose-dependent; however, even low doses might be sufficient to produce sedation, which reaches its peak after 45–60 min. The sedative effect decreases gradually after cessation of the infusion . Various mechanisms have been described to account for the analgesic effect of intravenous lidocaine: suppression of neuronal excitability (in myelinated A-ä and unmyelinated C fibers), suppression of central sensitization, inhibition of spinal visceromotor neurons, anti-inflammatory effects, blockade of nerve conduction, and decreased N-methyl-d-aspartate receptor activity, which plays a major role in postoperative hyperalgesia ,. The persistence of the analgesic effect after the infusion has been discontinued indicates prevention of spinal or peripheral hypersensitivity or both to painful stimuli, reflecting its effects on inhibition of spontaneous impulse generation arising from injured nerve fibers and from dorsal root ganglion neurons proximal to the injured nerve segments and suppression of primary afferent evoked polysynaptic reflexes in the spinal dorsal horn ,. In our study, patients in the Dex group were more sedated than patients in the lidocaine group over the 12 postoperative hours. After 15 min, the median sedation score was 3 in group D and 2 in group L. It started to decrease in group L after 1 h, with a median of 1, whereas it was 2 during the entire course of the recording period in group D. Our results are in agreement with those of Manne et al. (2014)  as the mean sedation score was calculated to be 2. In our study, most patients in both groups developed mild to moderate postoperative pain 15 min after arrival at the PACU, and two patients in group D developed severe pain; the 85.7 and 75% of patients in group D and group L, respectively, required pethidine of less than 50 mg. Over time, the severity of pain decreased as patients of both groups had no to mild pain. This effect of Dex is classically described as an opioid-sparing effect. Dex administered at 0.5 μg/kg/h has specific analgesic effect and provides visceral pain relief . In 1991, Aho et al. found 33% decrease in postoperative morphine use in patients undergoing laparoscopic tubal ligation with 0.4 µg/kg. Venn et al. in 1999  reported that Dex decreased the need for rescue analgesia significantly for up to 24 h after the operation, and Manne et al. in 2014  observed an increase in the time to receive first rescue analgesia, with a decrease in total analgesic requirements in the first 24 postoperative hours. As far back as in 1954, an intravenous infusion of lidocaine was shown to provide postoperative analgesia for more than 10 h . Vigneault et al. in 2011  demonstrated the opioid-sparing effect of perioperative intravenous lidocaine infusion. Perioperative lidocaine infusion has been investigated for laparoscopic surgery; Kaba et al. in 2007  found reduced postoperative opioid consumption as well as pain scores during activity after laparoscopic colectomy, and in 2012 Grady et al. noted decreased overall analgesic requirements in patients undergoing laparoscopic gynecological procedures. In contrast, Wuethrich et al. in 2012  noticed no improvement in postoperative pain and its related outcomes in patients undergoing laparoscopic renal surgery. α2-Adrenoceptors do not have an active role in the respiratory system; therefore, Dex has minimal effects on the respiratory system . At clinically effective doses, Dex has been shown to cause much less respiratory depression than any other sedative . In our study, respiratory depression was not encountered in any of the patients while in the PACU. Lidocaine infusion can be considered an effective modality similar to dexmedetomidine infusion, to control the hemodynamic response to pneumoperitoneum in patients undergoing day-case diagnostic laparoscopic gynecologic surgery. It provides an acceptable recovery profile and reduces the postoperative analgesic requirements without any significant respiratory impairment. Kaba A, Laurent SR, Detroz BJ, Sessler DI, Durieux ME, Lamy ML, Joris JL. Intravenous lidocaine infusion facilitates acute rehabilitation after laparoscopic colectomy. Anesthesiology 2007; 106(1):11–18. Angst MS, Clark JD. Opioid-induced hyperalgesia: a qualitative systematic review. Anesthesiology 2006; 104 (3):570–587. Srivastava VK, Nagle V, Agrawal S, Kumar D, Verma A, Kedia S. Comparative evaluation of dexmedetomidine and esmolol on hemodynamic responses during laparoscopic cholecystectomy. J Clin Diagn Res 2015; 9(3):UC01–UC05. Gertle R, Brown C, Mitchell D, Gertler R, Brown HC, Mitchell DH, Silvius EN. Dexmedetomidine: a novel secative-analgesic agent. BUMC Proc 2001; 14:13–21. Marret E, Rolin M, Beaussier M, Bonnet F. Meta-analysis of intravenous lidocaine and postoperative recovery after abdominal surgery. Br J Surg 2008; 95(11):1331–1338. Koppert W, Weigand M, Neumann F, Sittl R, Schuettler J, Schmelz M, Hering W. Perioperative intravenous lidocaine has preventive effects on postoperative pain and morphine consumption after major abdominal surgery. Anesth Analg 2004; 98(4):1050–1055. Baral BK, Bhattarai BK, Rahman TR, Singh SN, Regmi R. Perioperative intravenous lidocaine infusion on postoperative pain relief in patients undergoing upper abdominal surgery. Nepal Med Coll J 2010; 12(4):215–220. Chiruvella S, Donthu B, Siva JV, Dorababu S. Comparative study of clonidine versus dexmedetomidine for hemodynamic stability during laparoscopic cholecystectomy. Int J Sci Study 2014; 2:186–190. Yang SY, Kang H, Choi GJ, Shin HY, Baek CW, Jung YH, Choi YS. Efficacy of intraperitoneal and intravenous lidocaine on pain relief after laparoscopic cholecystectomy. J Int Med Res 2014; 42(2):307–319. Larsen JF, Svendsen FM, Pedersen V. Randomized clinical trial of the effect of pneumoperitoneum on cardiac function and haemodynamics during laparoscopic cholecystectomy. Br J Surg 2004; 91(7):848–854. Toyoyama H, Kariya N, Hase I, Toyoda Y. The use of intravenous nitroglycerin in a case of spasm of the sphincter of Oddi during laparoscopic cholecystectomy. Anesthesiology 2001; 94(4):708–709. Damen SL, Nieuwenhuijs VB, Joosten W, Houweling PL, Clevers GJ. The effects of remifentanil and sufentanil on the quality of recovery after day case laparoscopic cholecystectomy: a randomized blinded trial. J Laparoendosc Adv Surg Tech A 2004; 14(2):87–92. Hall JE, Uhrich TD, Barney JA, Arain SR, Ebert TJ. Sedative, amnestic, and analgesic properties of small-dose dexmedetomidine infusions. Anesth Analg 2000; 90(3):699–705. Venn RM, Grounds RM. Comparison between dexmedetomidine and propofol for sedation in the intensive care unit: patient and clinician perceptions. Br J Anaesth 2001; 87(5):684–690. Pandey CK, Priye S, Ambesh SP, Singh S, Singh U, Singh PK. Prophylactic gabapentin for prevention of postoperative nausea and vomiting in patients undergoing laparoscopic cholecystectomy: a randomized, double-blind, placebo-controlled study. J Postgrad Med 2006; 52(2):97–100. Wu CT, Borel CO, Lee MS, Yu JC, Liou HS, Yi HD, Yang CP. The interaction effect of perioperative cotreatment with dextromethorphan and intravenous lidocaine on pain relief and recovery of bowel function after laparoscopic cholecystectomy. Anesth Analg 2005; 100(2):448–453. Priyesh KR, Pinakin G. Effects on intraoperative hemodynamics and post-operative pain following systemic lidocaine in laparoscopic cholecystectomy surgery. Res Chronicle Health Sci 2015; 1:13–27. Ramsay MA, Luterman DL. Dexmedetomidine as a total intravenous anesthetic agent. Anesthesiology 2004; 101(3):787–790. Tanskanen PE, Kyttä JV, Randell TT, Aantaa RE. Dexmedetomidine as an anesthetic adjuvant in patients undergoing intracranial tumour surgery: a double-blind, randomized and placebo-controlled study. Br J Anaesth 2006; 97:658–665. Bhattacharjee DP, Nayek SK, Dawn S, Bandopadhyay G, Gupta K. Effects of dexmedetomidine on hemodynamics in patients undergoing laparoscopic cholecystectomy − a comparative study. J Anaesth Clin Pharmacol 2010; 26:45–48. Manne GR, Upadhyay MR, Swadia V. Effects of low dose dexmedetomidine infusion on haemodynamic stress response, sedation and post-operative analgesia requirement in patients undergoing laparoscopic cholecystectomy. Indian J Anaesth 2014; 58(6):726–731. Talke P, Chen R, Thomas B, Aggarwall A, Gottlieb A, Thorborg P et al. The hemodynamic and adrenergic effects of perioperative dexmedetomidine infusion after vascular surgery. Anesth Analg 2000; 90(4):834–839. Keniya VM, Ladi S, Naphade R. Dexmedetomidine attenuates sympathoadrenal response to tracheal intubation and reduces perioperative anesthetic requirement. Indian J Anaesth 2011; 55:352–357. Prasad SR, Matam UM, Ojili GP. Comparison of intravenous lignocaine and intravenous dexmedetomidine for attenuation of hemodynamic stress response to laryngoscopy and endotracheal intubation. J Dr NTR Univ Health Sci 2015; 4:86–90. Wijeysundera DN, Naik JS, Beattie WS. Alpha-2 adrenergic agonists to prevent perioperative cardiovascular complications: a meta-analysis. Am J Med 2003; 114(9):742–752. Priya V, Malviya PS, Mishra LS. Comparative evaluation of attenuation of post-extubation hyperdynamic responses with single dose dexmedetomidine or esmolol: a double blind, randomized, controlled trial. Asian Arch Anaesth Resusc 2012; 74:2199–2205. Patel CR, Engineer SR, Shah BJ, Madhu S. The effect of dexmedetomidine continuous infusion as an adjuvant to general anesthesia on sevoflurane requirements: a study based on entropy analysis. J Anaesthesiol Clin Pharmacol 2013; 29(3):318–322. Jaakola ML, Ali-Melkkilä T, Kanto J, Kallio A, Scheinin H, Scheinin M Dexmedetomidine reduces intraocular pressure, intubation responses and anaesthetic requirements in patients undergoing ophthalmic surgery. Br J Anaesth 1992; 68(6):570–575. Hogue CW Jr, Talke P, Stein PK, Richardson C, Domitrovich PP, Sessler DI Autonomic nervous system responses during sedative infusions of dexmedetomidine. Anesthesiology 2002; 97(3):592–598. Soliman RN, Hassan AR, Rashwan AM, Omar AM. Prospective, randomized controlled study to assess the role of dexmedetomidine in patients with supratentorial tumors undergoing craniotomy under general anesthesia. Middle East J Anaesthesiol 2011; 21(1):23–33. Ozkose Z, Demir FS, Pampal K, Yardim S. Hemodynamic and anesthetic advantages of dexmedetomidine, an alpha 2-agonist, for surgery in prone position. Tohoku J Exp Med 2006; 210(2):153–160. Miller CD, Warren SJ. IV lignocaine fails to attenuate the cardiovascular response to laryngoscopy and tracheal intubation. Br J Anaesth 1990; 65(2):216–219. Wilson IG, Meiklejohn BH, Smith G. Intravenous lignocaine and sympathoadrenal responses to laryngoscopy and intubation. The effect of varying time of injection. Anaesthesia 1991; 46(3):177–180. Vanluchene AL, Vereecke H, Thas O, Mortier EP, Shafer SL, Struys MM. Spectral entropy as an electroencephalographic measure of anesthetic drug effect: a comparison with bispectral index and processed midlatency auditory evoked response. Anesthesiology 2004; 101(1):34–42. Jones ME, Maze M. Can we characterize the central nervous system actions of alpha2-adrenergic agonists? Br J Anaesth 2001; 86(1):1–3. Haselman MA. Dexmedetomidine: a useful adjunct to consider in some high-risk situations. AANA J 2008; 76(5):335–339. Petrenko AB, Yamakura T, Baba H, Shimoji K. The role of N-methyl-Daspartate (NMDA) receptors in pain: a review. Anesth Analg 2003; 97:1108–1116. Willert RP, Woolf CJ, Hobson AR, Delaney C, Thompson DG, Aziz Q. The development and maintenance of human visceral pain hypersensitivity is dependent on the N-methyl-D-aspartate receptor. Gastroenterology 2004; 126(3):683–692. Pavlin DJ, Chen C, Penaloza DA, Polissar NL, Buckley FP. Pain as a factor complicating recovery and discharge after ambulatory surgery. Anesth Analg 2002; 95(3):627–634. Cortinez LI, Hsu YW, Sum-Ping ST, Young C, Keifer JC, Macleod D et al. Dexmedetomidine pharmacodynamics: Part II: crossover comparison of the analgesic effect of dexmedetomidine and remifentanil in healthy volunteers. Anesthesiology 2004; 101(5):1077–1083. Aho MS, Erkola OA, Scheinin H, Lehtinen AM, Korttila KT. Effect of intravenously administered dexmedetomidine on pain after laparoscopic tubal ligation. Anesth Analg 1991; 73(2):112–118. Venn RM, Bradshaw CJ, Spencer R, Brealey D, Caudwell E, Naughton C et al. Preliminary UK experience of dexmedetomidine, a novel agent for postoperative sedation in the intensive care unit. Anaesthesia 1999; 54(12):1136–1142. Vigneault L, Turgeon AF, Côté D, Lauzier F, Zarychanski R, Moore L et al. Perioperative intravenous lidocaine infusion for postoperative pain control: a meta-analysis of randomized controlled trials. Can J Anaesth 2011; 58(1):22–37. Grady P, Clark N, Lenahan J, Oudekerk C, Hawkins R, Nezat G, Pellegrini JE. Effect of intraoperative intravenous lidocaine on postoperative pain and return of bowel function after laparoscopic abdominal gynecologic procedures. AANA J 2012; 80(4):282–288. Wuethrich PY, Romero J, Burkhard FC, Curatolo M No benefit from perioperative intravenous lidocaine in laparoscopic renal surgery: a randomised, placebo-controlled study. Eur J Anaesthesiol 2012; 29(11):537–543. Doufas AG, Lin CM, Suleman MI, Liem EB, Lenhardt R, Morioka N et al. Dexmedetomidine and meperidine additively reduce the shivering threshold in humans. Stroke 2003; 34(5):1218–1223.